The Dorje (also spelled dorge), or Diamond Sceptre, is a Tibetan spiritual-ritual implement of great beauty and utility. The dorje is an artistic-archetypal representation of the ultimate spiritual dynamic, functioning as an active meditative component, a form-energy transceiver. Dorje and its corresponding Sanskrit term vajra generally translate as â€˜thunderboltâ€™ or â€˜diamondâ€™. This symbolically represents the irresistible force of the thunderbolt and the indestructible qualities of diamond. The dorje has archaic roots in the thunderbolt of Indra, the Hindu Jupiter. The form of the dorje as a sceptre or a weapon appears to have its origin in the single or double trident, which arose as a symbol of the thunderbolt in many ancient civilizations. Parallels have been suggested with the Teutonic god Thorâ€™s meteoric hammer, as well as the thunderbolt sceptres of Zeus and Jupiter. The ancient Rigveda, identifies Indraâ€™s vajra as a notched metal club with a thousand prongs. 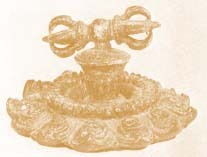 Further ancient sources identify the vajra as having open prongs, unlike the Buddhist dorje, which has closed prongs. According to legend, Buddha took the vajra weapon from Indra and forced its wrathful open prongs together, thus forming the peaceful Buddhist sceptre with closed ends, absorbing and sealing within the unbreakable and indestructible power of the thunderbolt. The vajra is the quintessential symbol of Vajrayana Buddhism, which derives its name from the vajra itself. This is the supreme path of Buddhism, the Thunderbolt or Diamond Wisdom. The true meaning of the vajra or dorje is far more comprehensive than merely being a thunderbolt sceptre-weapon of some local god. The dorje represents the highest spiritual power, that which is irresistible, invincible, indestructible and inexhaustible -- free from conflicting emotions. In Tibetan â€œdoâ€� means â€œstoneâ€� and â€œrgeâ€� means â€œmasterâ€�, and the â€œmaster stoneâ€� is considered to be the diamond: for its nobility, purity, clarity and ultimate hardness. The Master Stone is of course the Philosopherâ€™s Stone or prima materia of the Alchemists, and this symbolism is apropos for the dorje. The secret of the Philosopherâ€™s Stone is that anyone who attains it cannot use it successfully for base purposes such as riches and physical immortality, as such intent leaves one spiritually dead. The true Philosopherâ€™s Stone is not a physical object, but rather an awareness of the transformative power of awakened consciousness. The future is transmuted from the past by our current actions in the ever-present Now. We hold the power of responsible freedom as both our birthright and obligation on our path of spiritual evolution. The two sides of the dorje can be seen not only in the polarities of male and female, night and day, hot and cold, and so on, but also as the most dynamic of our experiential polarities: Matter and Spirit. And matter and spirit are reconciled in the thunderbolt of awareness, where we become the undifferentiated singularity of enlightenment and perceive all as One, subjective and objective united as a fundamental awareness. This is the ultimate Tantric doctrine. In its symbolic-artistic form the dorje is a sceptre, the emblem of supreme, sovereign power, hence the â€œDiamond Sceptreâ€�. It is the unmovable axis of the world around which the mandala of psycho-cosmic experience revolves. The dorjeâ€™s form corresponds directly to its function. The dorje is an archetype of universal polarities, as two mirror-image mandala heads emanate from the central point. The venoms of mortality are represented on one side with the wisdoms of enlightenment on the other. Astute meditators gain awareness of many correlations. There are three stages of the dorje: bindu, lotus and mandala -- representing spirit, mind and body, respectively. The central sphere is the â€œbinduâ€� or seed of the mandala which creates the universe. As the universe emerges from the unmanifest state, it forms into the miniscule point of the bindu, where undifferentiated unity splits into duality and our paths to awakening in the mandala begin. From the unity of the focal bindu-seed spring two opposing eight-petal lotus blossoms, representing the dualistic nature of manifest reality as perceived consciously. The symbolism of the lotus is as the meditation seat of the enlightened. From each lotus blossom emerge five â€˜rays of powerâ€™, which converge at a higher point on each side. Dynamic archetypal polarities are represented by the two sides of the dorje. On one side is this spatial realm we inhabit as physically incarnate humans, the other the subjective counter-spatial realm of mind and spirit. There are also dorjes with nine rays on each end, the four primary and four intermediate cosmic directions around the world axis. These nine can also represent the Buddha and his Eight-fold Path or the nine vehicles or stages of the Nyingma, or Tibetan â€˜old schoolâ€™ Buddhist tradition. The five rayed dorje contains the core archetype of the Holy Mountain Meru surrounded by the four quarters of the universe. From end on these five rays can be seen as the Vajrayana mandala of the Dhyani or meditation Buddhas. It consists of four stages around a central stage; the central stage being the expression of the quintessence in its Dhyani-Buddha form. The four surrounding stages, the remaining Dhyani-Buddhas, can be seen in many ways, the four phases of the day; four directions; four seasons, four ancient elements, four states of matter, four ethers. This fundamental quadrature structure pervades as a Divine metric of our experiential earth existence, and the mandala is the map. These Dhyanis are not sentient beings who have attained Buddhahood. These Buddhas are projections of the highest potentials of that which exists within each of us; the Principle of Enlightenment spiritually differentiated into our total being. This is not about attaining enlightenment, this is about maintaining those moments of enlightenment we all have at times. The Buddha nature lies within! We are already awake, our natural state of being. The material plane distracts us from our finest awareness through uncontrolled sensory input, emotive reactions and false beliefs. these five together comprising an individualâ€™s total life experience. The central Dhyani Buddha is Vairocana, the skandha of total consciousness, both encompassing and emanating the four Dhyani quadrants of the outer circle. Here we find the Wisdom of the Universal Law. Vairocanaâ€™s symbol is the wheel, the setting into motion the great Wheel of Life which allows the transformation of ignorance into absolute awareness. The Wheel of Life contains six realms, three of the upper world representing illusions of happiness and three of the lower world representing illusions of misery. These can be related to the six bardos or intermediate stages we pass through, three in life and three in death. The first quadrant is blue, as the sky at dawn. The Buddha is Akshobya, the unmovable, our physical form in the objective world unfolding from total consciousness. Here we find the Mirror-like Wisdom, teaching non-attached awareness of the manifest world as a reflection of the interior, the gateway of the subjective and objective. As a mirror reflects equally and dispassionately all before it, so the Mirror-like Wisdom transforms anger into non-reactive observation of all that is. The colour blue is mirror-like, as the surface of a calm lake reflects sky and terrain. Akshobyaâ€™s symbol is the dorje -- with its two poles mirroring each other, as the subjective and objective poles of reality non-reactively mirror each other in the clear state of enlightenment. The second quadrant is yellow, as the overhead sun at noon. The Buddha is Ratnasambava, the gift giving jewel, the skandha of perception, representing the outer and inner sensations felt by our being, the gift of experience. Ratnasambava lights all around us evenly in the Wisdom of Equality, transforming pride into saneness. We experience that all beings are equal before the pure light of spirit, just as the sun shines equally on rich and poor, good and bad. Ratnasambhavaâ€™s symbol is the jewel, whose radiance dissolves the boundaries of self. The third quadrant is red, as the warm setting sun after a fine day. The Buddha is Amitabha, the compassionate one. The skandha is Cognition, our processing of the perceptions gained through our physical form; Amitabha teaches us the wisdom of distinguishing inner vision. It is the realm of love and compassion; the Western Paradise of Bliss of devotional Pure Land Buddhist sects. Amitabhaâ€™s symbol is the lotus, the seat of meditation. Just as the sun sets, so do we turn inwards in meditation, transforming attachment into unity. The final quadrant is dark green, the night. The Buddha is Amoghasiddhi, wisdom of all-accomplishing karma-free action. The skandha is intention, representing our volitional responses after processing the perceptions gained through our physical form. It is the spiritually awakened free will, the realm of Wisdom, where jealousy is transformed into accomplishment. The symbol of Amoghasiddhi is the double dorje or visvavajra; vishva is Sanskrit for manifestation. It symbolises enlightenment in action, the conclusion of the practical achievements of the previous Dhyanisâ€¦ the mandala perfectedâ€¦ the four heads representing the Dhyanis of the four cosmic directions as a perfected spiritual organ. Here one is in the Tao, going with the flow. Before the beginning was Void. As the four directions formed in the impulse of creation, from them subtle winds began to flow filling the Void. After countless aeons of time, these magic winds formed into an immutable substance that formed the double dorje - the foundation of the physical universe. In ritual use the dorje is held in the right hand while a bell is held in the left. The dorje represents the masculine principle, compassion expressed through skilful means. The bell represents the female principle, wisdom; the hollow representing wisdom as inseparable from emptiness and the clapper represents the sound of emptiness. The ritual bell commonly has the dorje symbolism in the handle. To achieve enlightenment, these male and female principles must be conjoined to become one; the bell symbolising the body, the dorje the mind. The dorje can also be placed in front of the meditator so that one may optically absorb its artistically-functional structure into their being, whilst traveling a meditative path through its inherent correspondences. There is a higher form energy emanating from the dorje due to its archetypal structure, as understood in the western esoteric science of radionics. These exercises must be experienced directly; words alone cannot express the awakening of archetypes, as any visual or musical artist will testify. Meditation upon the dorje and constructing it in oneâ€™s inner realm will guide the body, mind and spirit to the awakened state where all the psycho-cosmic elements of our incarnation are integrated and raised to their highest level. The dorje is both Path and Symbol. It is an exquisitely curious artistic design that may be appreciated even if one is only at the preliminary stages requisite for the esoteric exploration of its utility. To begin meditation upon the dorje one will attempt to grasp its symbolism and structure and initiate the correlation of their worldly awareness-components to the archetypal structure. This progressively becomes easier and more intuitive. The dorje becomes an active inner spiritual â€œmap of the universeâ€� with which one may attain the highest levels of awareness whilst keeping grounded in their daily life. Samsara becomes Nirvana, consciousness transforms from mortal to immortal, and one perceives the infinite in the finite. The Philospherâ€™s Stone is attained. Heart and Mind function harmoniously together as a singular, responsive, non-reactive awareness. An archetype which provides life and growth engenders a fruitful philosophical pathway. Building a dorje in the imagination as an organ of cognition is one of the greatest and simplest of spiritual practices. Beyond intellect, it is the pure beauty of spiritual freedom which can only be grasped through uplifting actions in art, music and life.